Despite his family’s baffling generations-old ban on music, Miguel (Anthony Gonzalez) dreams of becoming an accomplished musician like his idol, Ernesto de la Cruz (Benjamin Bratt). Desperate to prove his talent, Miguel finds himself in the stunning and colourful Land of the Dead. Together with the charming trickster Hector (Gael García Bernal), he sets off on an extraordinary journey to unlock the real story behind his family's history. Director Lee Unkrich’s film is a visually stunning, consistently funny non stop adventure. A race against time with gripping twists and turns and a final ten minutes that packs a real emotional punch (excuse me, there’s something in my eye). As with the best family movies, Coco works on two levels. Younger audiences will be thrilled with the film’s constant movement, humour and bright colours. The story is easy to follow and full of engaging and charming characters. Hector is a real highlight, as is Miguel’s sidekick, Dante - a lovable, if eccentric dog very much in the vein of Moana’s Hei Hei. Meanwhile, adults will be impressed by Pixar’s gorgeous animation (Coco is often utterly breathtaking both in its sweeping ‘location’ scenes and also in its more intimate moments) and moved by the movie’s themes of grief and remembrance. Themes that are expertly developed and handled. While it does explore death and loss, Coco is a film (like Inside Out before it) that could help families deal with these sensitive and challenging subjects. Beneath the skeleton gags, lies a film that shows us the power of memory and how no one is ever really gone if we take time to remember them and tell their stories. Miguel’s adventure starts when he rebels against his family’s strict no music ban. He longs to play the guitar and idolises his town’s most famous celebrity - the musician Ernesto de la Cruz. It is interesting therefore that, bar the film’s main song (Remember Me - a poignant earworm if ever I heard one), Coco’s soundtrack did not leave any lasting impression. For example, I had Moana’s soundtrack on hard rotation for weeks. 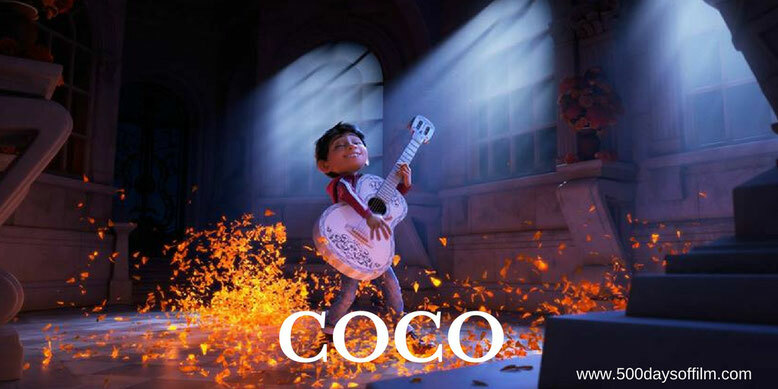 While it didn’t spoil my cinema experience (and I loved how Pixar animated Miguel’s guitar playing), I have no inclination to do the same with Coco. Coco is a funny and charming adventure. It may not reach the heights of Pixar’s best movies but it is, nonetheless a deeply moving, emotionally intelligent film with heart to spare. I took exception to some of the marketing for Coco. A couple of the trailers intimated that this was the first animated film to take us into the Land of the Dead. Hello people, Book Of Life? Jorge R. Gutiérrez’s film is one of my favourite animated movies and one I would thoroughly recommend. The good news is that there is more than enough room for two movies exploring Mexico’s Day Of The Dead. If you have, what did you think of Pixar’s animated film? Let me know in the comments section below or let’s chat over on Facebook or Twitter (you can find me @500DaysOfFilm). Just watched this and it is another home run for Pixar. And I'm with you of Book of Life. That was also a fantastic movie. Coco is a deeply moving ode to the importance of family, and of acceptance. I loved it. Hi, thanks for reading my review :) So glad that you loved Coco too!